Rebecca finally has the time to think about her life in New York. Something is missing in both her professional and her personal life. When she meets Theo, a local carpenter, there is a spark. Only Rebecca isn't supposed to stay. She values his friendship and loves spending time with him. She's getting a whole new life in Wiscasset and because of that becomes harder and harder to leave. Joy doesn't want her there and Michael keeps pressuring her to come back. What will be Rebecca's decision? Will Joy defrost or is a connection with her sister out of the question? 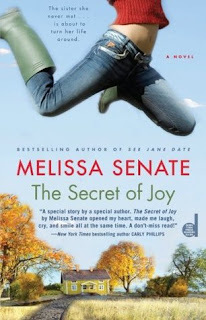 I love Melissa Senate's books because her writing is so warm and open. I immediately loved Rebecca. She's such a sweet and generous person. I kept wishing she'd have a better life. Joy has a lot of personal problems and having a sister in her life all of a sudden is one too many. Even though she's unkind to Rebecca at first I liked her very much. She's tough and honest, but she's also caring. The divorced women, who are Joy's friends as well as clients, are such a fun addition to the story. Melissa Senate has a great sense of humor. Wow, I can't imagine finding out that you have a sibling when you're an adult. It would be a big emotional roller coaster!